The award winning excel V™ is the only tunable laser system on the market that combines two ultra-precise, best-in-class laser wavelengths (532/1064 nm) in one device. Delivering precision treatment parameters with unmatched versatility, excel V has the flexibility to treat both superficial and deeper vascular conditions and is safe to use on all skin types. Excel V has been shown effective at treating a number of conditions, including rosacea, spider veins, leg, veins, port wine stains, cherry angiomas, periorbital veins, and even sun damage. Excel V treats both mild and severe forms of these conditions. The system also has a cosmetic benefit for patients who have skin lesions or scars from past injuries or surgeries. A sensation of warmth is temporarily present. This is generally gone within 30 minutes. Over the vessels treated there is a puffiness that appears similar to the skin reaction to a cat scratch. This is also resolves spontaneously. 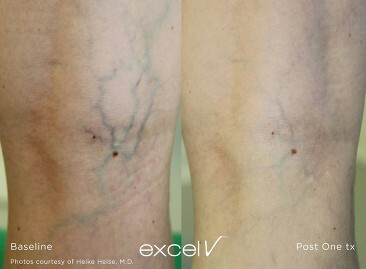 The results of laser treatment for spider veins are not immediate. After the laser therapy, the vessels underneath the skin will gradually change from a dark blue to light red color, then eventually disappearing in two to six weeks (similar to the healing of a bruise). Additional treatments may be needed to achieve the desired result. During the 24 hrs after treatment, it is best to avoid strenuous exercise and exposure to extremes in temperature (such as hot tub or sauna use). However, no compression stockings are required. Most patients report a high degree of satisfaction with the procedure and relief at no longer having to hide unsightly veins. The treated areas are noticeably clearer and in most cases the skin continues to improve with each successive treatment. What are advantages of laser over sclerotherapy? Recovery is immediate. The use of compression stockings is not required. However, sclerotherapy (or other more involved procedures) may be needed for the treatment of vessels greater than 4 mm diameter. 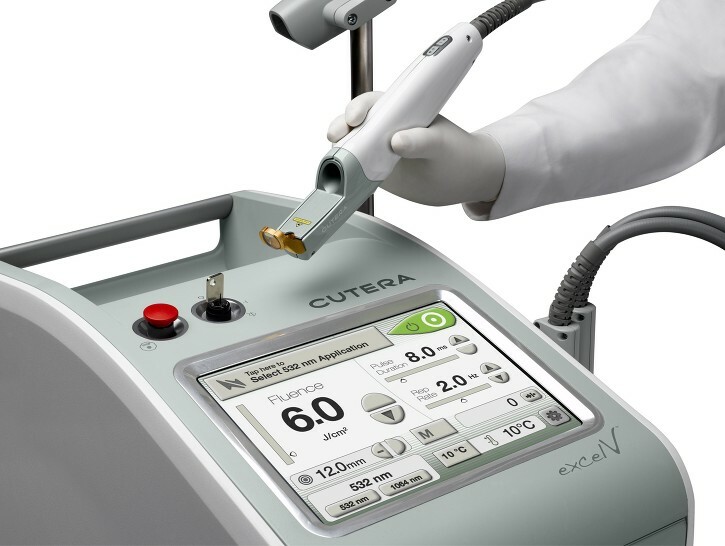 Complications of any laser treatment are rare, but include blistering, skin necrosis, crusting, scarring, skin discoloration, and failure to achieve desired result. Who should not have a laser leg vein treatment? If you are pregnant, laser treatments are not recommended- not because there is any expected risk to the baby but because the treatments have not been formally studied in pregnant women and it is possible that hormonal shifts could in some way affect response to treatment in an unpredictable way. If there is an active skin infection in the area to be treated, or if you are expecting to have unusually higher level of sun exposure (vacation or other trip) the treatment will need to be rescheduled. If you have large varicose veins, Dr. Vuich may recommend that you have these addressed first through other procedures and then return for treatment of the spider veins at a later date. The time required to close the number of vessels you have can be estimated at the time of your initial consultation. If you’re interested in learning more about our Spider Vein Procedure, call us today to schedule your appointment.